Above was the entry in Green Hill’s Mortuary Report for Thomas Jones, a widowed bookkeeper & native of England who passed away from “collapse from Dissipation.”2 Curious, I researched Mr. Jones and found information that shed more light on the woeful events surrounding his death in November 1891. Thomas was known as a homeless and friendless alcoholic whose drink of choice was whiskey. On the cold evening of November 13 he was suffering from some sort of attack stemming from exposure to the elements in association with heavy consumption of alcohol when he appeared at the Home for the Sick. 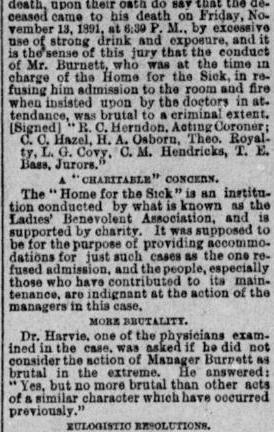 The Home for the Sick was a charity-funded operation ran by the Ladies Benevolent Association that helped ill people, usually males, who didn’t have families to address their needs. The manager of the Home wouldn’t allow Thomas to stay there despite being told by two doctors that he was in desperate need of attention. Mr. Burnett, the manager, would not even allow Thomas to remain in the waiting room area to warm his cold bones in front of the fire. It’s possible that he thought that Thomas was merely drunk and not sick. Thomas was taken across the street to a drug store where he unfortunately expired shortly after. 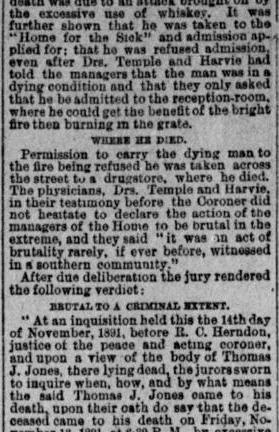 The coroner held an inquest into Jones’ death where Drs. Harvie and Temple, who had tried to help Thomas gain admission to the Home, both condemned the actions of Mr. Burnett as harsh. One of them was quoted as saying, “It was an act of brutality rarely, if ever, witnessed in a southern community.” Dr. Harvie even suggested that the practice of turning away people in need was not new for Mr. Burnett. 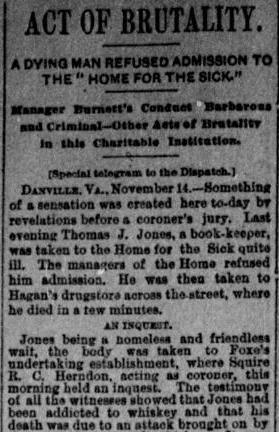 At the conclusion of the inquest, the manager’s actions were found to be “brutal to a criminal extent.”1 I don’t know if this carried any penalty, but it seems like the charitable people who helped keep the Home for the Sick in operation were peeved about Mr. Jones’ death and how it was linked to the facility. Another fantastically interesting post. Poor Mr Jones. Unfortunately I fear this still happens to this day where people are refused medical care due to misdiagnosis. A recent case in my local news is of a poor woman who died of a heart attack when she was misdiganosed with indigestion by an emergency doctor.